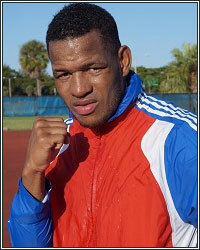 Former WBC International Light Heavyweight world champion Sullivan Barrera (21-2, 14 KOs) returns to the ring to regain his standing as one of the world's top light heavyweights. Barrera faces top five light heavyweight contender "Irish" Seanie Monaghan (29-1, 17 KOs) in the 10-round main event at The Aviator Sports and Events Center in Brooklyn, NY on Saturday, November 3, 2018. The event is promoted by Main Events and will be streamed live via Facebook Watch as part of the Golden Boy Fight Night series. Tickets are priced at $125 and $100 for VIP ringside seats and $50 for general admission. They are available to purchase now through Eventbrite or by calling Main Events at 973-200-7050 or emailing boxing@mainevents.com. Barrera, 36, a native of Cuba who defected to the United States after fighting for the Cuban National Team, now lives and trains in Miami, Florida. He makes his return to the ring after taking WBA Light Heavyweight Champion Dmitry Bivol deep into the 12th round of their title fight in March before being stopped, by far the most difficult opponent of Bivol's professional career. The WBC ranks Barrera fourth in the competitive Light Heavyweight division. "Thank you to my team, my coach Derik Santos, my promoter Main Events, my manager Luis Molina, and thanks to Seanie Monaghan for taking this fight," said Barrera. "As always, I'm willing to face the top guys in my division. This is another tough fighter. I look forward to November 3, and I'll give the fans a great show. They will see me start to climb my way back up to facing the very best light heavyweights in the world." Barrera's trainer, Derik Santos, said training is already underway for the fight. "We are working and are dedicated as usual. Thank you to manager Luis Molina and our promoter Main Events. Sullivan has gone into tough fights over the years and has consistently shown himself to be one of the toughest light heavyweight contenders in the division." Despite the pressure on them, Barrera and Santos maintain the same confidence and positive attitude that led Barrera to the top. "Train well and overcome, has been the directive since day one," declared Santos. "Our expectations are the same today." Barrera is no stranger to Seanie Monaghan, and he's looking forward to the matchup. "This fight is do or die for both of us. I've been going back and forth with Barrera on Twitter for a couple of years now. This will finally be our chance to settle it in the ring, no more talking," said Monaghan. Monaghan lost his father over the summer. He planned from that day to bring the late Davy Monaghan's ashes back to his hometown of Navan in Ireland someday while wearing a title belt around his waist. His fight with Barrera is as much for his father as it is for himself. In the ultra-competitive light heavyweight division, the talent pool is deep, and virtually every fighter ranked among the Top 15 contenders is a threat to the current titleholders. Main Events' CEO and Barrera's promoter, Kathy Duva, originally selected this high-stakes fight as a perfect fit for the Main Events-promoted card in the Golden Boy Fight Night series and remained resolved to make the fight happen after the cancellation. "Expanding access to our fan-friendly fights around the world with online streaming technology is the latest chapter in the 40-year history of Main Events," said Duva. "Boxing has always been able to adapt and stay current as a sport." Duva promised: "Technology has changed a lot in this world, but one thing will never change about Main Events: our determination to make the best matches and feature amazing athletes in the ring. We wanted Sullivan Barrera and Seanie Monaghan in the ring and were more disappointed than anyone when the original bout was postponed. We were determined to make this fight happen, because I know these guys will give everything they've got for their legacy, and for the fans." About Barrera-Monaghan: This light heavyweight main event will headline the Saturday, November 3 card as part of the Golden Boy Fight Night series on Facebook, live from The Aviator. The event is promoted by Main Events. The action will be streamed live globally on Facebook Watch via the Golden Boy Fight Night Page beginning at 6:00 p.m. PT/9:00 p.m. ET.